In Asia Monday Japan's Nikkei 225 Index fell 1.2% to 10,238 and Hong Kong's Hang Seng Index dropped 0.7% to 23,447. In China the Shanghai Composite Index climbed 1.4% to 2,791. 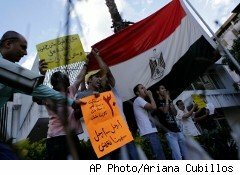 Continuing unrest in Egypt sent shock waves through stock markets as far away as Japan. In Tokyo, benchmark gauges fell to their lowest levels so far this year, dragged down by negative sentiment about companies doing business in the Middle East. Investors around the world headed towards less risky assets as Egyptian anti-government protests and the threat of violence escalated. "The market saw more uncertainty emerging, and we are seeing moves out of risky assets after the unrest in Egypt," an equity manager from Nikko Cordial Securities told Japan Today. Among Japanese stocks worst affected were Chiyoda Corp., which builds and maintains industrial plants, including oil refineries. The company slumped 2.5%. JGC Corp., another industrial plant firm that counts on the Middle East for more than 30% of its revenue, slid 0.5%. Nissan was hit hard, falling 2.2% after shutting down its factory in Egypt. Other carmakers also closed lower with Mazda, which only just inked a deal with Egypt's GB Auto to distribute vehicles there, according to just-auto.com, plunging 3.2%. Honda slid 1.4% and Isuzu declined 0.5%, while Toyota managed a 0.3% gain. Electronics exporters slumped with Toshiba plummeting 3.2%, Sony plunging 2.7%, Sanyo giving up 2.3% and Sharp losing 1.9%. Konica Minolta tumbled 7.8% after slashing its operating profit outlook. Other film and camera companies were also depressed with and FujiFilm sinking 3.1%, Olympus shedding 2% and Canon losing 1%. Gloomy forecasts also affected computer equipment company Fujitsu, which nosedived 6.1%. In Hong Kong, property companies stumbled with Li Ka-Shing's Cheung Kong plunging 2.8%. Li-Ka Shing's empire spreads far beyond Asia. In London, he's got plans to convert a funky old power station in Chelsea Harbour into a luxury residential and retail development, much to the consternation of local residents who see the ancient structure as a landmark in the vein of the nearby Battersea Power Station, which was featured on the cover of Pink Floyd's Animals album and in the Beatles movie, Help! -- not to mention its location on a small street with limited access and parking. Hutchison Whampoa, another Li Ka-shing company, ended the day down 2.4%. Other Hong Kong real estate firms also fell, with Sino Land spiraling 2%, New World Development off 1.2% and Henderson Land down 0.6%. Hang Lung, meanwhile, managed a 0.7% gain. Oil company PetroChina zipped up 3.1%, adding to its gains of 17% over the past six months. But Cnooc edged down 0.7% after sealing a deal to pay $570 million for a stake in U.S. Chesapeake Energy's Niobrara shale project, reports Bloomberg. The deal could be a direct result of Hu Jintao's January visit to the White House. In Shanghai, the Egyptian crisis was a boon to oil companies as crude prices advanced. Sinopec climbed 1.6% and Chinese-listed shares of PetroChina gained 1.2%. China Oilfield Services, which sets up oil wells in China and provides geological information, rallied 7.4%.